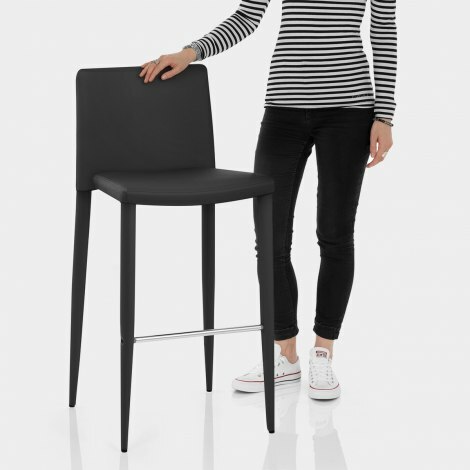 Chic and stylish, the Healey Kitchen Stool Black is one of a kind. Fixed in height, it stands at the perfect level for use in the kitchen or domestic bar area. A completely uniform design that is utterly efficient, the Healey is set to be the finishing touch to your interior. 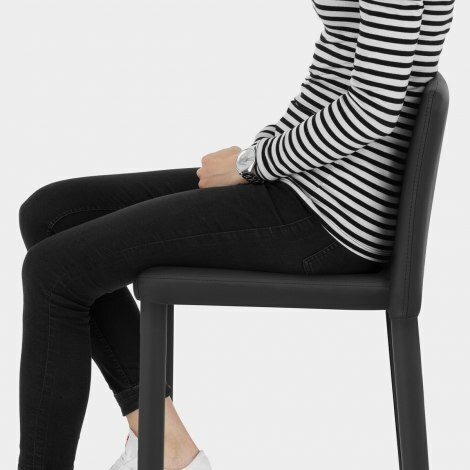 Its distinctive design incorporates a neatly formed square-shaped backrest, padded with high-density foam for comfort and upholstered in smart black faux leather. Strong and sturdy, the four-legged metal frame is upholstered in matching faux leather, each of the legs tapering gracefully to the floor. Plus, a contrasting chrome footrest lends extra support and practicality. Stackable for compact storage, the Healey also features subtly incorporated protective floor plugs beneath to help look after your floors. "Very impressed with the quality and design of the stools"
Fast delivery and nice product , very happy, look classy. Had been looking for quite some time to find kitchen stools which were stylish and value for money. These stools have exceeded that. They fit perfectly in our kitchen. I wasn’t sure about the faux leather on the legs but now they have been put together they are impressive. Really nice looking stools, ordering and delivery very easy and really quick. Don’t hesitate!! I bought 4 of these bar stools in the end having spent ages looking at gas lift stools. I wasn't sure whether I was going to like them as the pictures online do not do them justice. Seeing a photo that somebody sent in was what made me choose the, I ordered one to see if I liked it in the flesh. I was so impressed I immediately ordered another three. They are the stool equivalent of Jimmy Choo stilettos, they are so beautiful! They are also comfortable. They look far more expensive than they are, I would highly recommend. I purchased 5 of these chairs a few weeks ago and am very pleased with them so far. I had previously brought bar stools from Atlantic before which had lasted us 7 years so had no hesitation when purchasing again. The look, quality and design of the the chairs is very good.. Look forward to getting another 7 years use!! Thank you for your service. I have shopped with atlantic before so i was confident that they would provide good service. The black Stools arrived 2 days after ordering,looking as i expected,they are a no fuss stool but have a chrome foot rest which sets off the design.well padded and a good height back.